Shenzhen recollections | Realise the World! The excitement of our first bus trip within China was growing rapidly by the minute. For the first time we could all ‘check-in’to the bus as a group and the luggage troubles seemed a distant memory, just for now. The bus ride was around 2-3 hours and as we had had a late night, most people spent their time catching up with the much needed rest. The trip was about as smooth as it gets. We all closed our eyes and before we knew it, we were in the beautiful city of Shenzhen, being welcomed by yogis with beaming faces and so much joy in their hearts. 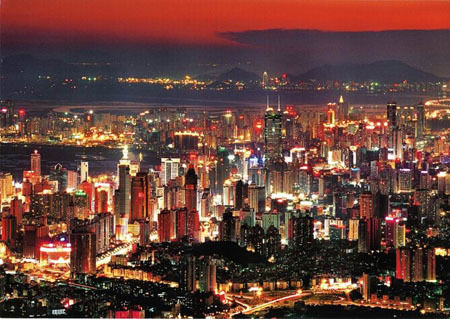 A wise man told us all “Shenzhen was a experiment of Deng Xiaoping in Chinese capitalism”. Yes! Lyndon is the wise man. We were also informed that it was chosen for its close proximity to Hong Kong and still has an independent administration under the supervision of the Chinese Government. While the trip was being planned in Australia, no one had thought about the time, effort and skill that goes into setting up the sound system at each of the locations (especially in a huge auditorium with 16 musicians). We were all so pleased that Tony decided to come along on the ride. Not only does his saxophone gives everyone Goosebumps, his knowledge of how to set up the sound system was invaluable. However, the team that was called in to do the sound system required a little more education than we would have liked. Tony had to call in Alex Henshaw for some extra help and together, the sound system was set up in no time. The concert started off with ‘Raining on the Rock’ with huge images of Uluru filling the backdrop, and was followed by ‘We are the Children of the Earth’ and ‘Mauline’. Our next song, ‘Xio Cau’ seemed to touch a cord with the audience and the pleasant surprise on their faces was evident. It was then that the people of Shenzhen opened up their hearts and let the vibrations through. Everyone in the crowd was clapping with the song and we even found a few faces singing along with big smiles. Mother’s love had touched their hearts. After songs like’ Jai Jai Bolo’,’ Kindle my Heart’, ‘Om Gam Gamapataye’ and the interactive’ Jogwa’, the realization session was so powerful that it really felt like we were sitting in a puja. All the 700 odd seekers raised their hands when they were asked who felt the cool breeze on top of their heads and in their hands. This was a realization of mass proportions for the city of Shenzhen. Everyone in the audience and on the stage could feel the peace within and the love our Mother in our hearts. The final session of the concert started with the ‘Guruashtakam’ which deepened everyone’s experience of Thoughtless Awareness. Now, with everyone in the state of total bliss, it was time to get up and start dancing. ‘Siyahamba’ got people of their seats and swaying to the beat of the African rhythm, which was followed by ‘Haida’. Lene, Tony and Sobik took the lead and they had everyone dancing in no time. The dancing was beautiful and everyone there seems to be having a great time. Even the faces that were a little uncertain before, we now up and dancing their hearts away. As we started to sing ‘Mata O Mata’ in the praise of our Diving Mother, everyone wished that we had some ‘dandia sticks’ for a lot of open space to dance. All the Chinese and Hong Kong yogis then joined us on the stage as we sang ‘Pass it On’, alternating between the English and the Chinese verses. ‘Padhare’ was a lovely end to the evening and everyone seemed to have established peace within. The joy filled faces of all the seekers just reaffirmed the wonderful feeling that comes with people getting their self realization and how important this work is. Another up to 700 people out of China’s population of 1.3Billion now knew of Sahaja Yoga and had experienced Thoughtless Awareness. Mother’s blessings on this great country of China are really amazing with the number of yogis nearly doubling every year. Totally blessed out and feeling the excitement among the local yogis seeing the number of seekers that showed an interest to come to follow up programs, it was now time to have a quick bite to eat before going to bed. On the way to dinner, a local yogi explained: “In Chinese culture, having guess is the biggest privilege and we always offer them the best we can”. We soon worked it out that we weren’t going to get away with a ‘quick bite’. After a rather large dinner, it was clear how much love and affection our Chinese brothers and sisters had for us and how they were doing everything possible to make our stay as enjoyable as they could. The city of Shenzhen is nothing like we expected. Between the fastest growing economy on the planet and an ever increasing Maya all around, the Chinese people seem to have a beautiful and simple heart. The love and dedication with which the yogi worked tirelessly to set up everything for the Sahaj programs, looked after us and showed us the purity of their large hears was really humbling. The love they showed us with every smile, filled out hears with complete ‘Nirmal Anand’, often bring a tear to our eyes. Our brother and sisters of this side of the world did really make us their own and touched our hearts deeply. The next day we were on our way to Wuhan for another 2 programs before going to Chengdu, Beijing and Shanghai in the China league of the tour. Even though we would be eventually departing this great country of Maha Genesha in a few days, we too have already left our hearts in China. I’ve upload some photos about the concert in Chengdu. Congratulations! For the divine bliss you bring to us, which gives us great and beautiful exprience and encouragment.